4. Upper chest circumference- Above breasts and under armpits. 5.Bust circumference- Fullest part of breasts. 6. 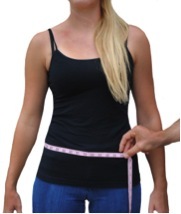 Natural waist circumference: Narrowest part of waist (between ribcage and hip bones). 7. Upper hip circumference-Around the upper part of the hip bones in the front (iliac crests) and above the buttocks in the back. 11.Shoulder width- From the bony bump at the base of your neck to shoulder joint (Not the outside edge of shoulder). 12. Sleeve length* (while gripping handlebars)- From bony bump at the base of your neck around outside of arm and elbow, to wrist..
13. Front jacket length- is a Personal preference. Putting on another Motorcycle jacket(For reference purposes only) will help. Start from the base of the neck as shown, down the front of the jacket to the length desired. Note*: If the front length does not extend a minimum of 2 ½” below the waist belt line, it should Always be zipped to the pant. 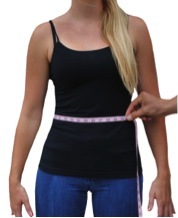 When the front jacket length is lower than 2 ½” below the waist belt line it is not mandatory to zip to the pant. Short jackets can ride up the torso while riding or in a tumble.